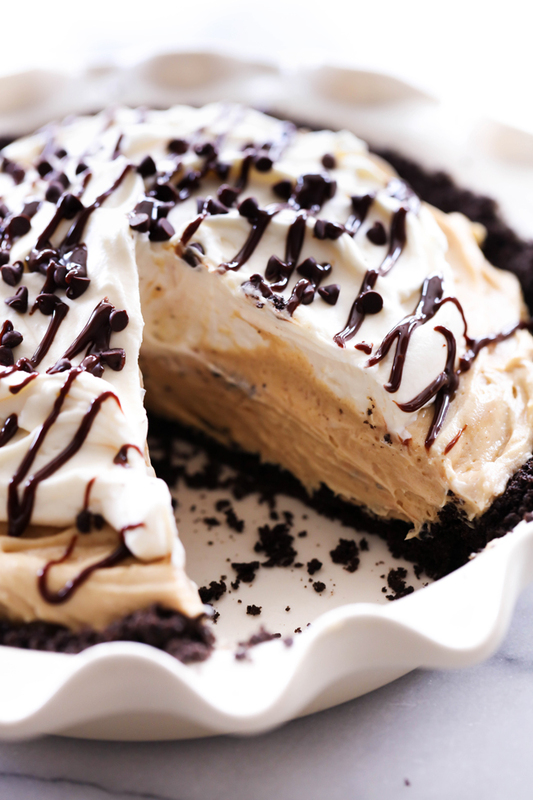 This Chocolate Peanut Butter Cream Pie is a show stopper! The amount of peanut butter flavor is perfection and wonderfully paired with a simple Oreo crust. The two together make for a heavenly bite each and every time! I have a confession to make. I am typically not a peanut butter fan. I know. Gasp, right?! My husband, however, is a HUGE peanut butter fan. So I try and make him desserts that have peanut butter incorporated in because I know the feedback will always be positive. I have been in a pie making mood lately. I actually have a couple more pie recipes sitting in my queue waiting to be posted and shared with you. This baby inside my tummy loves all things sugar so naturally I want to make more things with sugar haha! So remember how I said earlier that I typically don’t like peanut butter? Well, lets just say I ate half this pie all by my lonesome. It is SO incredibly delicious! 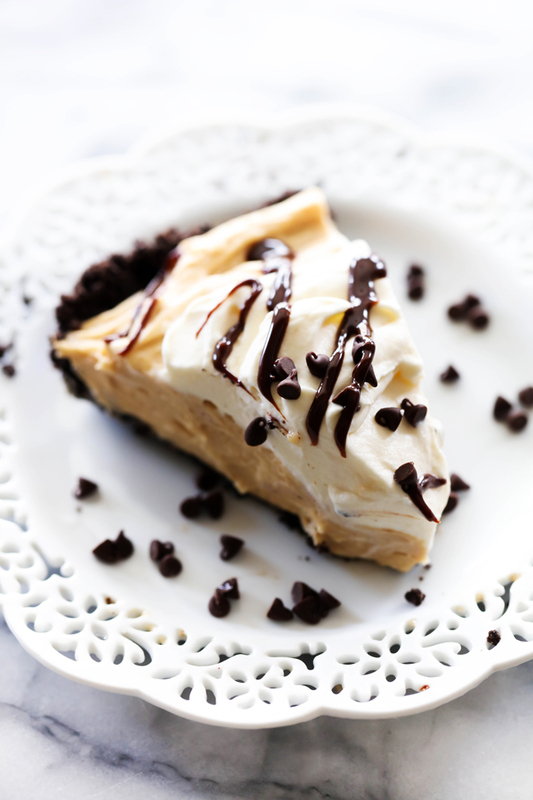 In fact, this pie is one of my favorites! Peanut butter lovers and haters alike I think will agree that this pie is tasty ;) It has the perfect amount of peanut butter without being too overbearing. The cream helps soften the flavor. The Oreo crust is such an idea crust for this recipe and compliments it beautifully. If you are looking for the perfect dessert to serve at your next holiday meal or get together, give this pie a try! Rave reviews will be pouring in from all who try it! Blend oreos in a food processor. In a medium mixing bowl combine them with the melted butter and press into a 9 inch pie pan. Place the crust into the refridgarator for 1 hour. In a small mixing bowl beat cream for two minutes and then add powdered sugar and beat until stiff. Set aside. In a large mixing bowl beat cream cheese, peanut butter, and powdered sugar until smooth. Add the whipped cream that was set aside and beat again. Pour peanut butter mixture into pie crust. 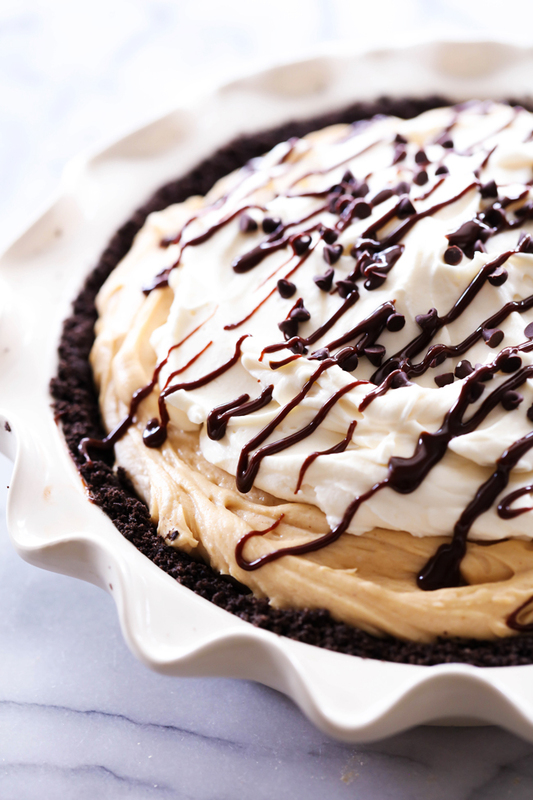 Top peanut butter cream pie with whipping cream. Soften hot fudge in microwave for about 25 seconds. Drizzle over the top of the whipping cream. I noticed you have the powdered sugar listed twice under the peanut butter pie filling. Is this correct?